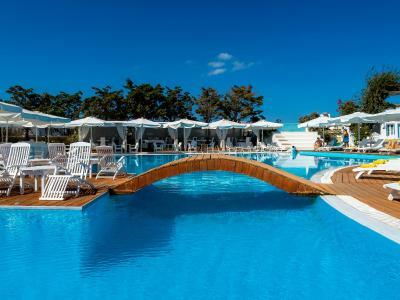 Lock in a great price for Chora Resort Hotel & Spa – rated 9.2 by recent guests! 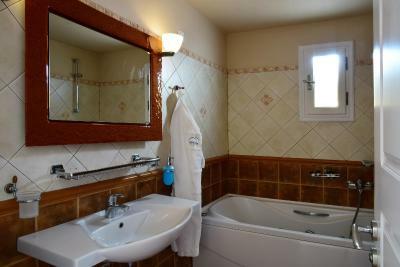 The location was great, close to the town center, restaurants, and shops. The staff was very friendly and helpful, and really made us feel welcome. The whole complex was really beautiful, we had a room next to a little chapel. Would definitely recommend this hotel! It is a very good hotel and highly recommended. 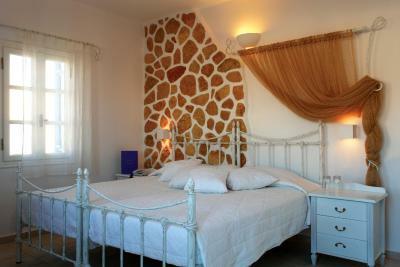 Offers everything to guests feel at home, very nice pool and good breakfast. 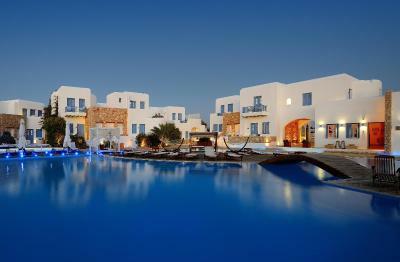 Chora resort is perfect. Just sitting on the edge of the pedestrianised village centre of Chora, it's quiet and tranquil whilst being central and accessible. The staff were so lovely and accommodating. The room was bright, spacious and airy with lots of windows and natural light, overlooking the pool. I would stay here again in a heartbeat and look forward to returning. We loved our stay at Chora Hotel and only wished we could have stayed longer. 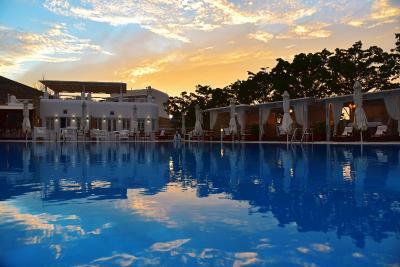 The rooms are spotless, comfortable and quiet and the pool area is so relaxing with lots of sunbeds, drinks and snacks available at the bar all day long and a gorgeous pool. 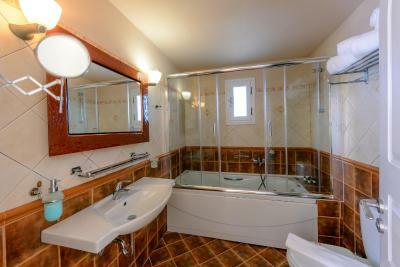 The town is just a couple of minutes walk away and is absolutely charming. We had some trouble with our ferries being cancelled and the staff went out of their way to help which we really appreciated. They were fantastic - thanks to all. 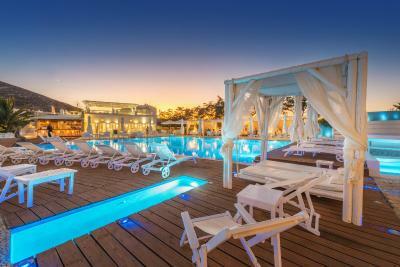 The pool area was breath taking and very well looked after. Loved the breakfast and every member of staff went out of their way to make our stay a trip to remember. 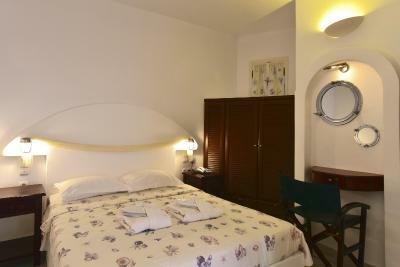 Pick up from the Ferry, right beside the main town, lovely room with a view of the church, lovely pool and lounge area. The staff were very nice and gave us tips of places to visit on the island. Would highly recommend visiting this island and staying here. Lovely relaxed atmosphere with excellent service - great facilities and location. Absolutely loved our stay. The staff were wonderful in every way. They became friends by the end of our stay not just staff. The place was spotless clean. 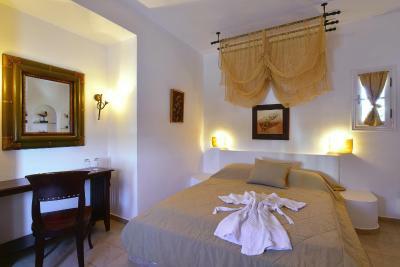 Fresh crisp sheets and lovely soft sweet smelly towels daily. Awesome cocktails and great food. The kids loved the pool ( and beaches). Chora town just round the corner which was just gorgeous, and the bus stop at the front door. Beautiful views from our room, church on one side and gorgeous sunsets on the other. And a huge balcony to relax on as a family too! Couldn't have asked for more. Highly recommended! 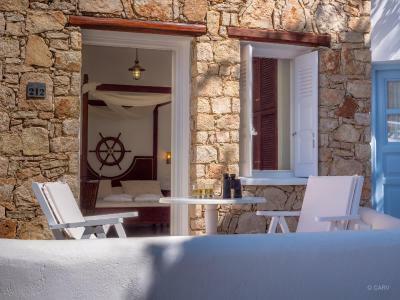 Chora Resort Hotel & Spa This rating is a reflection of how the property compares to the industry standard when it comes to price, facilities and services available. It's based on a self-evaluation by the property. Use this rating to help choose your stay! 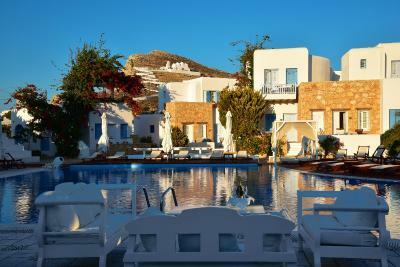 Escape to this beautiful resort on the small island of Folegandros, in the southern part of the Cyclades. 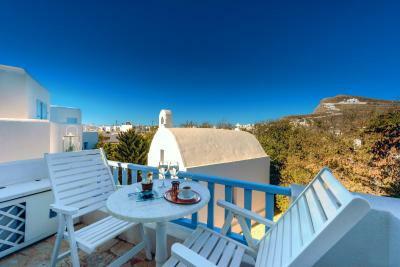 The center of Folegandros is just 650 feet away. Free WiFi access is available throughout. 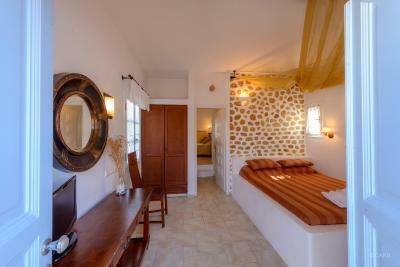 Rooms have air conditioning, a hairdryer, separate bathrooms and a satellite TV. Keep fit in the fitness center or enjoy a massage at the spa and wellness center. The outdoor swimming pool with hydromassage facilities is the best spot to pass lazy days in the sun while taking in stunning views of the area. See the small white houses in the cliff of the mountain, which offer even more magnificent views of the deep blue waters. The modest town offers a few traditional Greek cafés. Enjoy the seclusion and peace as you explore the island on foot. 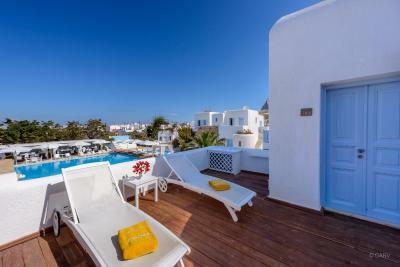 Find beautiful beaches, private bays and traditional areas unmodified for tourists. A short journey away is the port at Karavostassis if you wish to island-hop or to see a different resort. 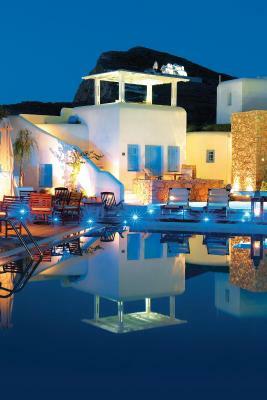 When would you like to stay at Chora Resort Hotel & Spa? 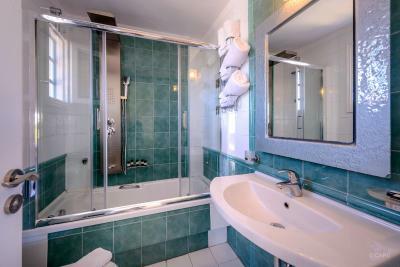 This air-conditioned room features pool-view balcony and bedroom. 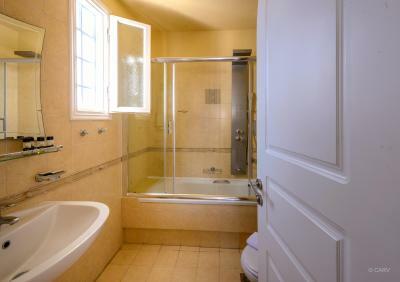 Opening to a balcony with pool views, this air-conditioned room features a bedroom and seating area. 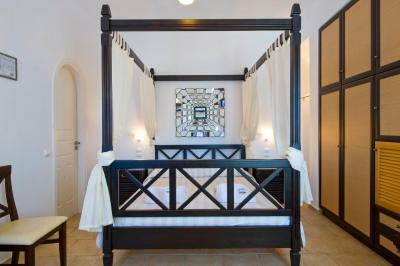 The air-conditioned room features a bedroom,and a balcony with pool view. Opening to a balcony with pool views, this air-conditioned suite features a living room and bedroom. 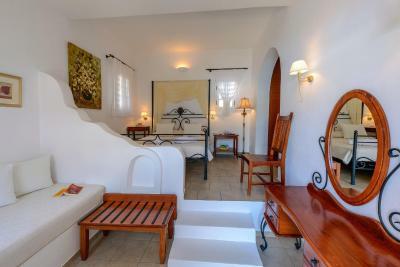 Opening to a spacious veranda overlooking the pool, this 2 bedroom suite features 2 bathrooms. Air conditioning comes standard. 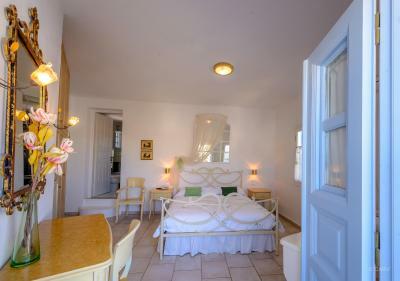 This air-conditioned room features a bedroom and balcony with garden views. 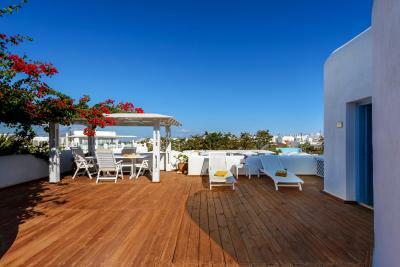 Opening to a patio with pool views, this air-conditioned bungalow features a balcony and bedroom. 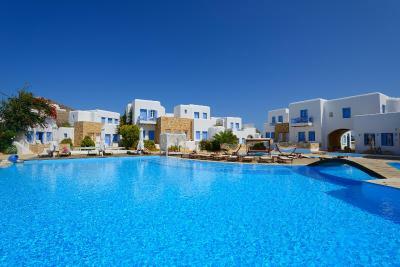 House Rules Chora Resort Hotel & Spa takes special requests – add in the next step! 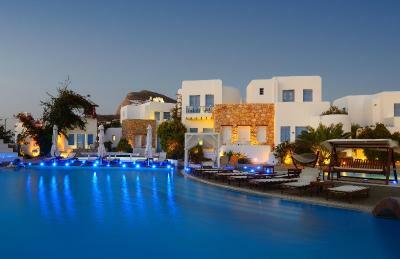 Chora Resort Hotel &amp; Spa accepts these cards and reserves the right to temporarily hold an amount prior to arrival. 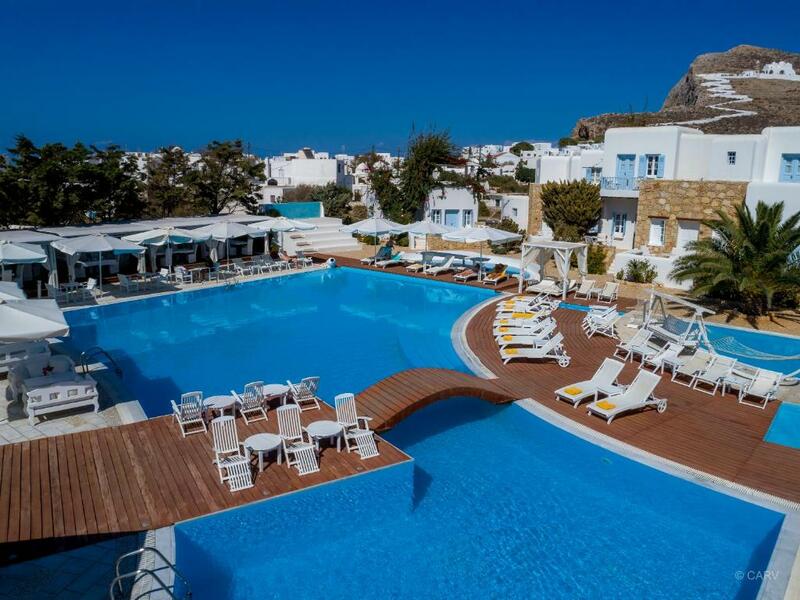 Chora Resort Hotel & Spa accepts these cards and reserves the right to temporarily hold an amount prior to arrival. Please note that all remaining payment is due upon arrival. Please inform Chora Resort Hotel & Spa of your expected arrival time in advance. You can use the Special Requests box when booking, or contact the property directly using the contact details in your confirmation. - the breakfast was good but tiny things like fresh mushrooms and great coffee could/should be improved. The bathroom felt a bit small. The bed was a bit rough and not very comfortable. Mattresses need improvement. Also, the room was not very spacious. Other than that everything was great. We will revisit the hotel for sure as we visit the island every year. 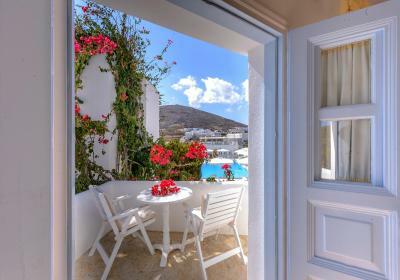 Perfect location inside the village of Chora. Impressive pool. Breakfast was good. Good value for money. We were offered a free upgrade on a room with a pool view. It would be good to be able to make a hot drink in your room. The coffee in the breakfast need to improve. Everything was very good. The stuff was very friendly and helpful.